Kochi: Dr. R.K. Tyagi, President, Aeronautical Society of India while speaking on the occasion of inauguration of Naval Aviation Innovation Exposition held at Kochi jointly by AeSI, SIATI and Indian Navy on 11th July, 2018, called for strengthening the indigenous aviation echosystem for Indian Defence Forces. 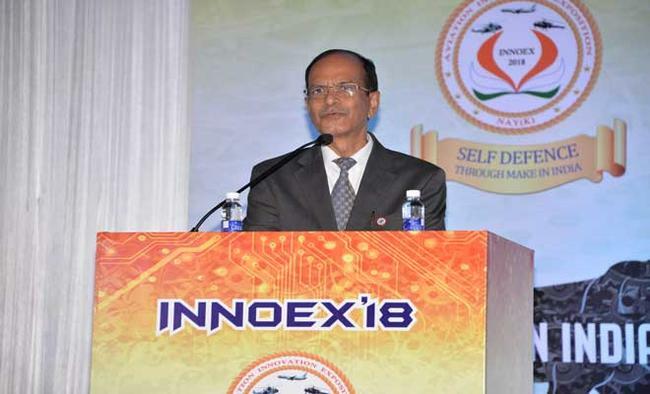 Dr. Tyagi pointed out that in the recent past, Ministry of Defence has taken many good initiatives like Defence Planning Committee, Revised Make II Procedure, Defence Production Corridors in Tamil Nadu and U.P., Third Party Inspections, Defence Investors Cell and Innovations in Defence Excellence. He also spoke about the emerging opportunities for production in aerospace and defence industries in India. Dr. Tyagi also called upon higher allocation of budget for defence forces, better technology management and enabling of important national projects like LCA, AMCA, UAVs/Drones. He also advocated for a strong offset policy . Other eminent speakers in the inaugural session, R Adm. Philipose G.Pynumootil , FONA, Dr. C.G. Krishnadas Nair, President, SIATI, Dr. Tessy Thomas, DG (Aero), also spoke about various initiatives taken by Indian Navy, DRDO and MSMEs. The efforts of Indian Navy for indigenous development of technology and naval systems was also highly appreciated.